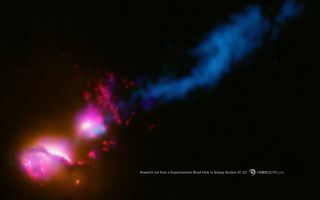 This composite image shows the jet from a black hole at the center of a galaxy striking the edge of another galaxy. This composite space wallpaper shows the jet from a black hole at the center of a galaxy striking the edge of another galaxy. The jet impacts the companion galaxy at its edge and is then disrupted and deflected.